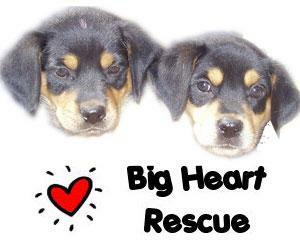 The Big Heart Rescue Society was formally organized as a non-profit charity (Canada Revenue Agency charity number: 877348508RR0001) in Aug. 2002 and since this time many, many companion animals have been vaccinated, sterilized, vetted, fostered and adopted. We are funded 100% by generous donations from community members and supporters with all proceeds going directly to the care and rehabilitation of companions in need of medical intervention, training and re-homing. In addition to this web site ( www.bigheartrescue.com ) we maintain a listing at www.bigheartrescue.petfinder.com of the pets we are trying to place. Big Heart Rescue does not have a shelter facility and all companions in our care are in loving foster homes until they find the family that is a perfect match. There is always a shortage of loving temporary foster homes available and unfortunately this limits our ability to help those in dire need of assistance. If you have room in your heart to give a lonely dog a place to rest please send us an email (spiritsmission@shaw.ca) requesting a foster or adoption application. One of our board members will be in contact with you as soon as possible.